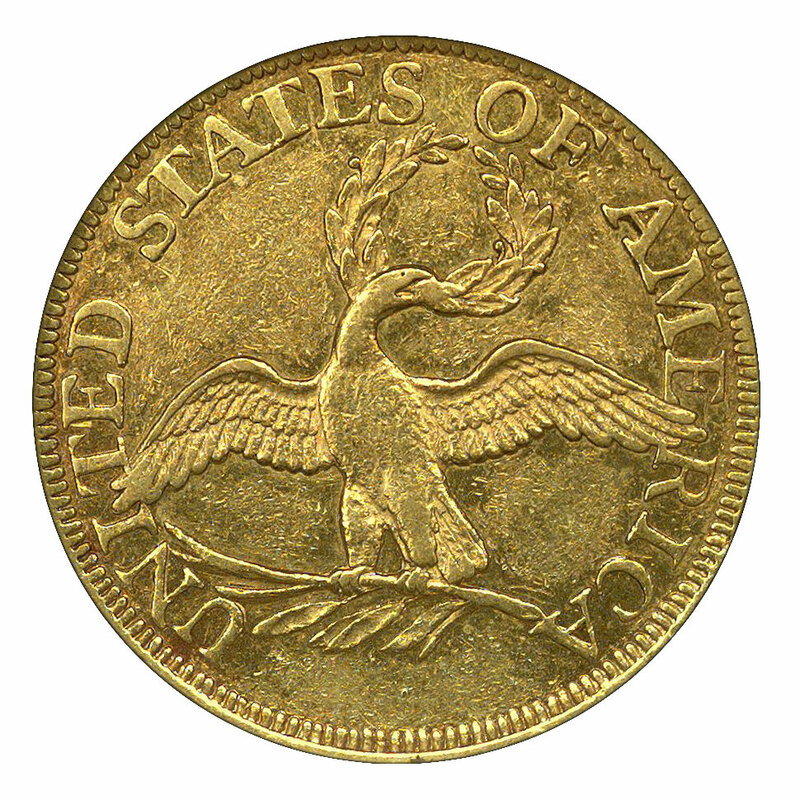 The half eagle, or five-dollar piece, was the first of three authorized gold denominations to be struck by the United States Mint. The initial inability of the mint's coiner and assayer to post their security bonds had delayed the coining of both silver and gold, and it was not until July of 1795 that the first gold pieces bearing the legend UNITED STATES OF AMERICA were produced. 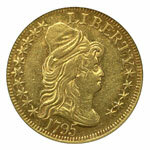 Mint Engraver Robert Scot created an allegorical bust of Liberty with long, flowing hair and a peaked cap. For the reverse he depicted a rather slight eagle grasping an olive wreath in its beak and a palm branch in its talons. This simple and attractive motif was used for the reverse as late as 1798 to avoid wasting serviceable dies. In the meantime, a new reverse design had already been adopted that featured the Great Seal of the USA. Since coins having this Heraldic Eagle reverse are known bearing the date 1795, it's evident that obverse dies were likewise used until they failed, making it unclear exactly when any of these coins were actually struck. Half eagles of the Draped Bust/Heraldic Eagle type were produced through 1807, that year being transitional with the new Capped Bust type. 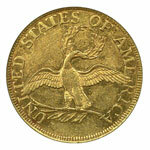 As the first United States gold coins, a fair number of 1795 Small Eagle five-dollar pieces were preserved uncirculated for the delight of collectors. This is certainly not to imply that they are common, rather that they are more available than other dates of this type. The other Small Eagle dates are very rare in uncirculated condition. In fact, most of the surviving coins of this type are lightly circulated, though not heavily worn. Because their metallic value exceeded their face value as reckoned against silver coins, these gold pieces typically were exported and melted before they could acquire much wear. In fact, it's likely that most of them became worn through use as jewelry or pocket pieces rather than from extensive circulation. Small Eagle five-dollar pieces usually are found well struck overall, though certain areas are subject to some lack of definition. The border denticles are sometimes ill defined, as are the coin's centers, consisting of the hair around Liberty's ear and the eagle's breast feathers. Aggravating this situation is the frequent presence of file marks from the planchet adjustment process. Planchets found to be heavy were filed across their faces to remove the excess metal prior to striking, and this scarring is often evident on the finished coins. Only when the file lines are especially deep do they affect a coin's grade. These same problems are evident on Draped Bust/Heraldic Eagle fives. If anything the central weakness and file scarring is more noticeable, since the greater complexity of the reverse design left more cavities in the die. While the fields of the die typically flattened these file lines, the die cavities were less effective at eradicating them. Coins of the Heraldic Eagle type offer a greater number of dates from which to select a type coin, though only a couple of these are available in mint state with any frequency. The most readily available date is 1806. It comes with either a knobbed or pointed tip on the numeral 6. Draped Bust half eagles of either type are seldom found without some degree of cleaning, and the major grading services allow for this fact. Those pieces that retain a natural appearance are still certifiable despite a light cleaning. 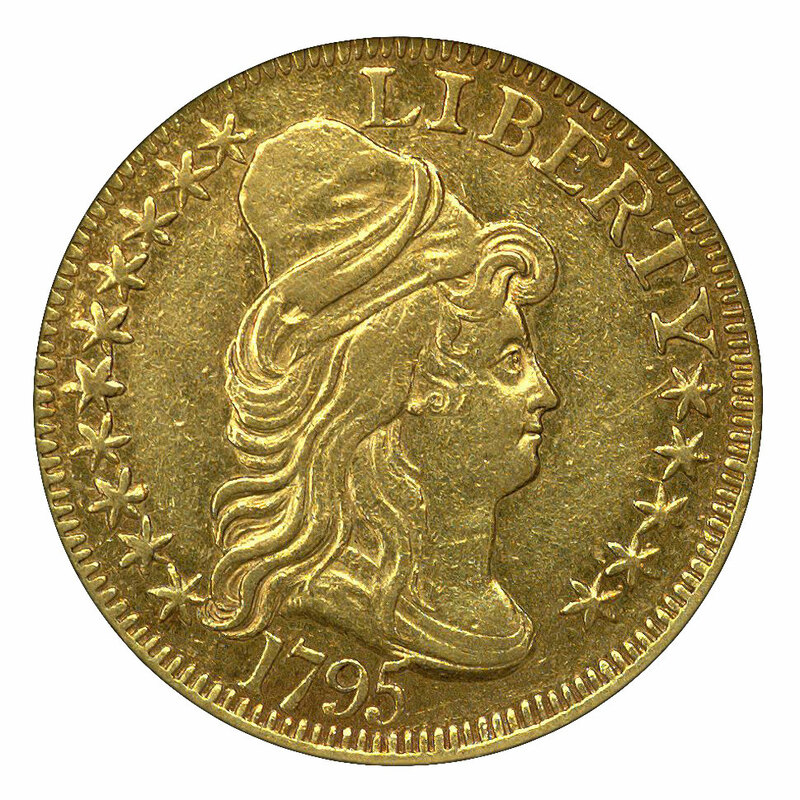 Beware of repaired coins, since early USA gold pieces were frequently used as jewelry by later generations until the coins acquired significant collector value.